Many environmentalists are having a meltdown over President-elect Donald Trump’s choice to head up the EPA, and it “has nothing to do with climate change,” radio host Erick Erickson said on Dec. 8. 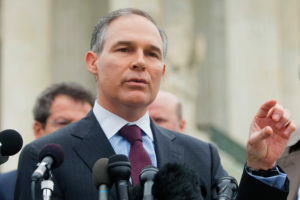 The left insists that Trump’s pick, Oklahoma Attorney General Scott Pruitt, is a climate change denier and has no business managing the EPA that he has often sued. “With the blessing of the Department of Justice, the EPA has been going after major corporations and telling those corporations that they can pay a massive fine to the federal government or pay a lesser amount to various environmentalist groups. “More often than not, to get the EPA off their backs, the companies fork over money to leftwing run environmentalist groups. Those groups then begin a vicious cycle. They start hounding the corporations that give them money, file complaints with the EPA, then get the EPA to shake down the companies for more money,” Erickson said. “Enforcement actions brought by governmental authorities for violations of environmental or other natural resource laws are often settled on terms that require defendants to make community service or restitution payments. In turn, these types of payments are generally required to be applied in a manner that provides some redress for the underlying violations.